Nestled in the Magalies Mountains on the banks of the Magalies River, 40 minutes from Johannesburg and Pretoria rests Green Leaves. Our all-in-one wedding venue encompasses a romantic chapel, elegant ballroom, luxurious bridal suite and 4-star accommodation. Breath-taking views and natural surroundings make it a serene haven for those seeking an experience of spectacular beauty. 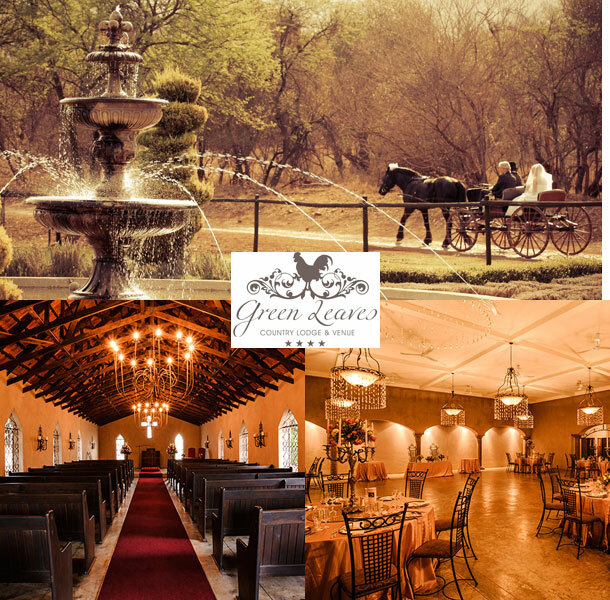 With its impeccable levels of service, superb cuisine, and unique extras such as a horse drawn carriage, Green Leaves prides itself on being the most exclusive wedding venue. Our recently added Tuscan Hall caters for a maximum of 120 guests. Its authentic feel and intricate design creates a wonderfully intimate experience. The Hall also boasts a magnificent view of the Magalies Mountain from the veranda, letting the scenery envelop you and your guests with its natural beauty. We also 26 rooms available for accommodation for your wedding guests. To book your wedding at this lovely venue visit Green Leaves for further details or to send an enquiry.